Oyonnair is approved for medical evacuations. Oyonnair has a fleet of aircrafts designed for medical transport of patients with a medical team. 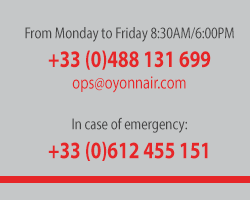 With our pilots' experience and 24/7 availability, Oyonnair transports medical surgeons in order to carry out medical transplantation. Oyonnair has been chosen and is under contract with all the hospitals in France.